Roti canai is bread made of flour, water, eggs, and ghee (clarified butter) that is repeatedly kneaded, folded, oiled, flattened, and tossed before it’s cooked in a skillet. Making roti canai is an art in itself that results in delicious bread that’s crispy on the outside, soft and fluffy on the inside. Simply put, it is a disk of stretched dough, a flatbread aspiring to be part-pancake, part-crepe. The roti canai is thoroughly Malaysian in that it is a meal in itself, with numerous variations of preparation and flavor that serve as the perfect expression of the country's food culture. With Indians arriving in British Malaya in large numbers by the turn of the last century first to work on rubber estates and later oil-palm plantations, Indian street vendors began hawking what back home was called a “paratha”. 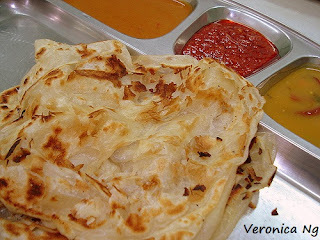 It almost certainly was showcased first in the arrival ports of Penang and Singapore, where roti canai still retains the name roti prata; in India "roti" refers to any sort of bread. By the 1920s, this dish was established throughout the Malayan peninsula. Roti canai is found wherever there's a hot grill outside a food shop, fronting the ever popular “mamak stalls” manned by Indian Muslims that also serve rice, noodles and snacks ("mamak" is derived from the Tamil word for "uncle"). Today’s roti canai has been tweaked with the addition of various stuffing including but not limited to roti telur (with egg), roti pisang (creamy melted bananas) and roti boom (sweetened with syrup). Recent innovations include roti Milo (sprinkled with chocolate powder) and roti banjir (to flood as in soaked in gravy). All Malaysians know that a good roti canai should be light, soft and buttery on the inside and flakey and slightly crunchy on the outside. It ought to be singed in places, without being burned. While the basic version should come round and puffy, the elaborate editions can be square or come with folded corners to keep the stuffing from running. The main difference between the various rotis is in the skill of the man who makes it, with the roti canai being edible by itself. Your roti canai maker will serve your crispy roti canai by placing it on a flat surface and giving it a soft clap with both hands to fluff it up. In keeping with modern conveniences, this staple food is now available in frozen form whereby pre-fried roti canai is processed through a blast-freezing technique to ensure a soft and fluffy texture upon defrosting and refrying. However, any and all styles of roti canai make a perfect accompaniment to endless laid-back conversation about the country's latest politics, fueled by glasses of teh tarik (tea made with condensed milk, ("pulled" and poured until it forms aerated bubbles).